We had a fantastic expedition up to Berry Head today. Having ventured out as little as possible yesterday, battening down the hatches whilst the wind and rain howled around the house, we were invigorated by the sight of blue sky over breakfast. Of course by the time we had got ourselves together to leave the sunshine had turned to drizzle, and by the time we were heading up into the woods Arthur was in the middle of his first hail storm. Undeterred, we squelched up the steps to flat(ish) ground, and he sped off on his balance bike in search of puddles. And boy did he find some. 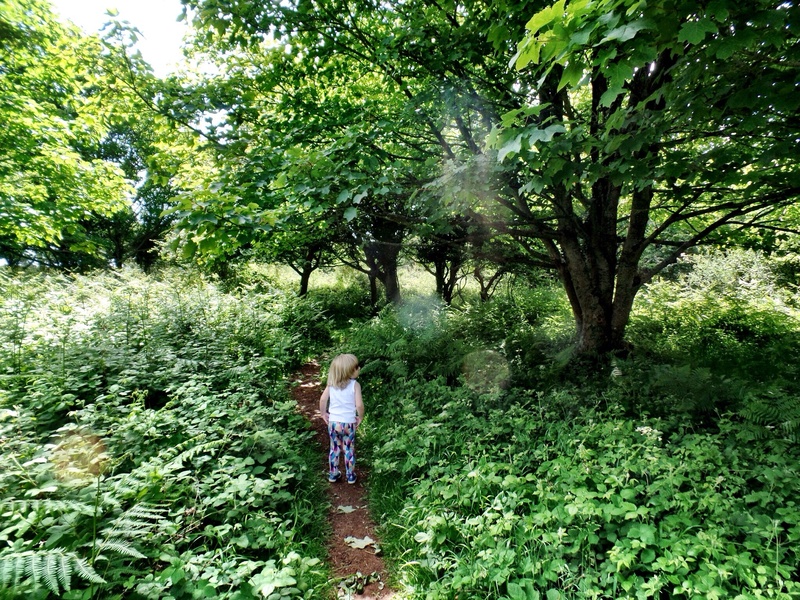 By the time I took this photo, his wellies were full of muddy water, his trousers were soaked through to the skin, and his little hands were like ice blocks. He, of course, was utterly delighted with himself. 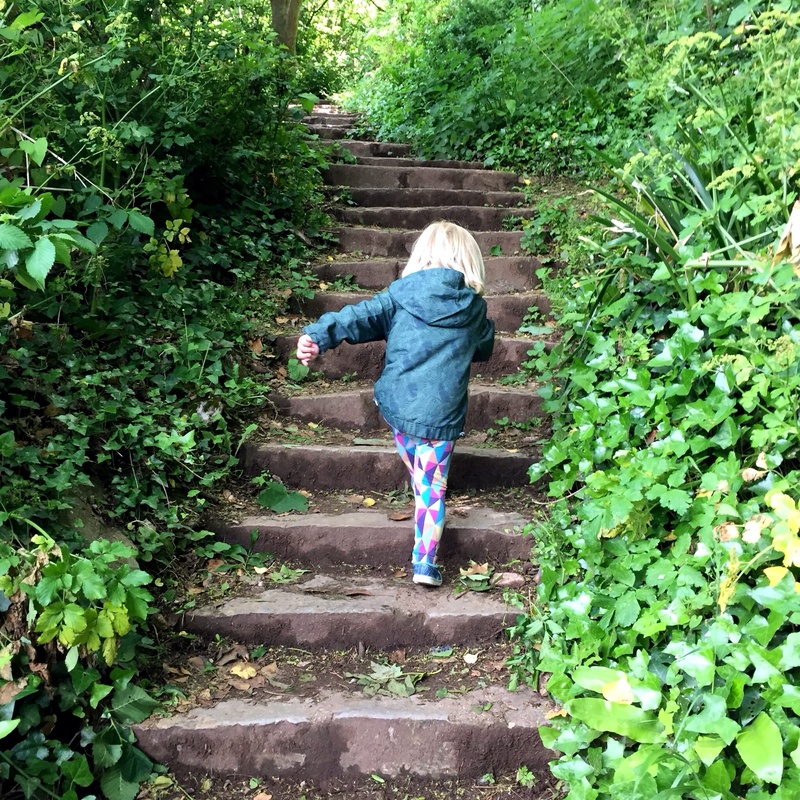 This entry was posted in Sophie is parenting, Uncategorized and tagged adventures, balance bike, Berry Head, brixham, Childhood, puddles on February 7, 2016 by sophieblovett. To have a beach – Arthur’s beach – on the way home from town is probably the reason I love living here the most. 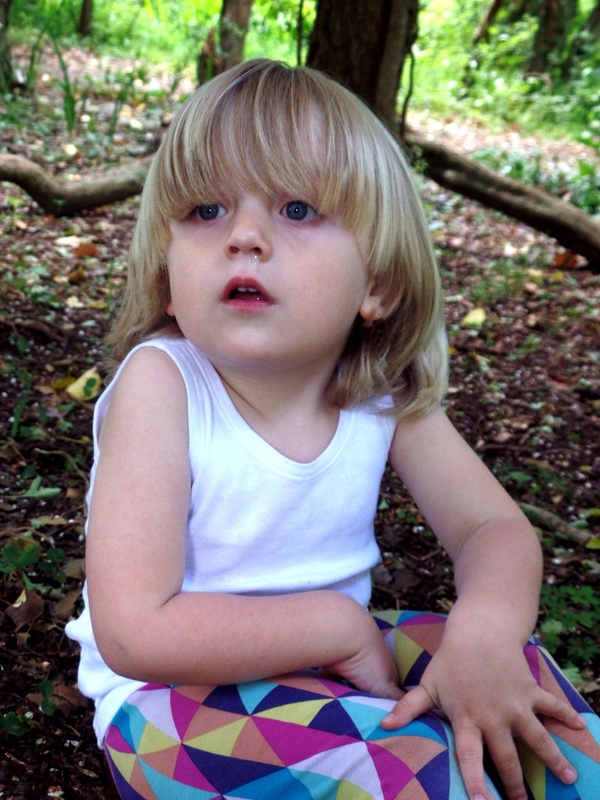 He is so completely at ease there – could spend hours throwing and climbing and sitting and looking. At this time of year it’s particularly special, because more often than not there is no-one else around. Just me and my Arthur, the stones and the sea. 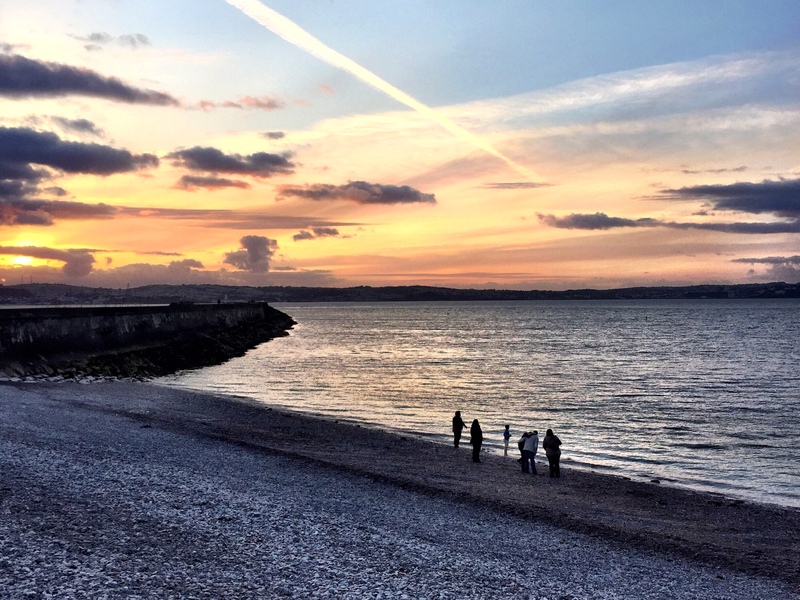 This entry was posted in Sophie is parenting, Sophie is photographing, Sophie loves Brixham, Uncategorized and tagged beach, Breakwater beach, brixham, play on January 24, 2016 by sophieblovett. Arthur in his happy place. 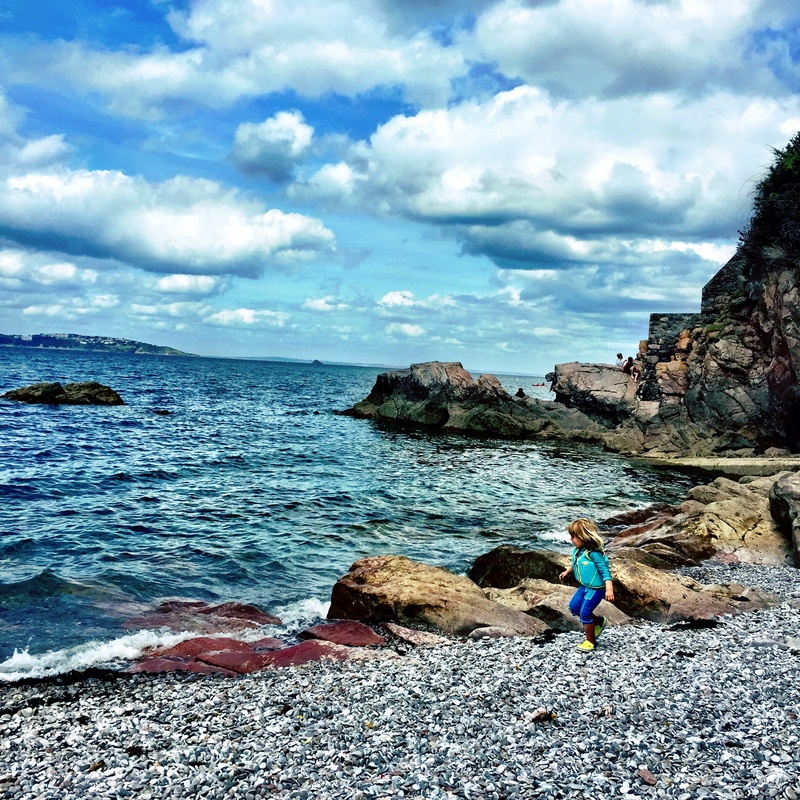 Throwing stones into the sea is still one of his very favourite things to do, but he loves to explore the beach now too: clambering over the rocks at the end whilst I watch, heart in my mouth and muscles poised to leap to his rescue if he needs me. 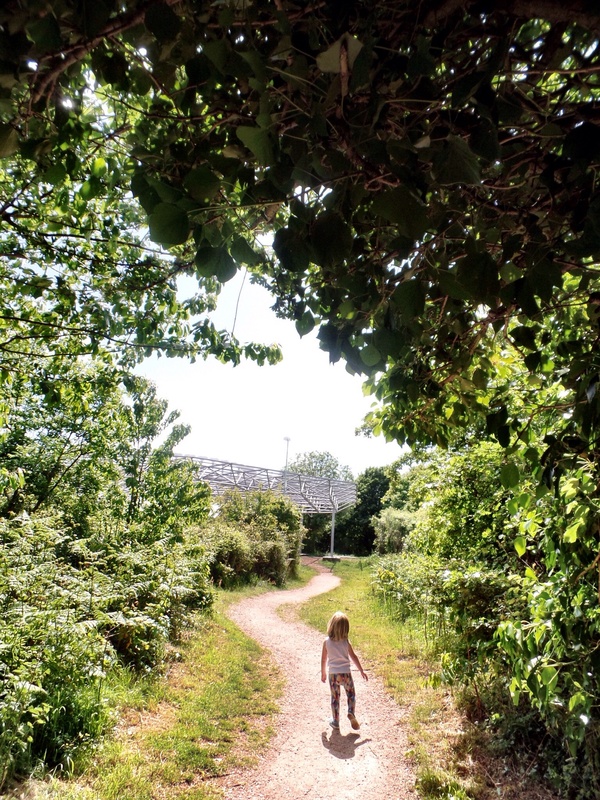 I sometimes lament the lack of manufactured play areas near our house, but really of course this natural playground has so much more scope. And whilst Arthur plays I get to breathe in the sea, listen to it tumble the pebbles at its shore and lose myself in its bigness for a few precious moments before we continue with our day. 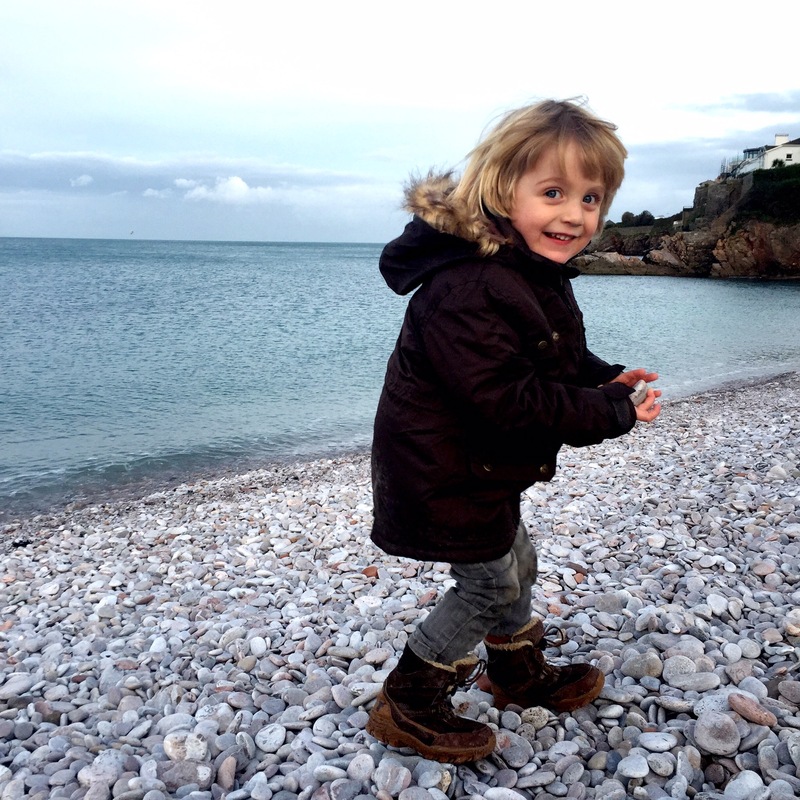 This entry was posted in Sophie is parenting, Sophie is photographing, Sophie loves Brixham, Uncategorized and tagged beach play, Breakwater beach, brixham, toddler on December 13, 2015 by sophieblovett. 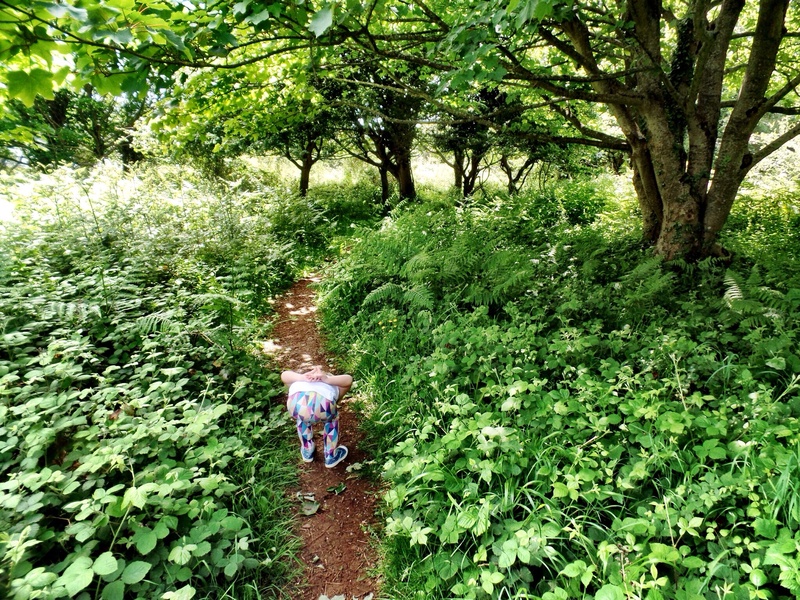 We went for a walk in the woods this week. Arthur had been asking for a while – unusually, as he tends to prefer the sea. And so once the rain had cleared and the colds we have both been laid low by had begun to recede we headed up towards the trees. It’s a walk we’ve done many times before. 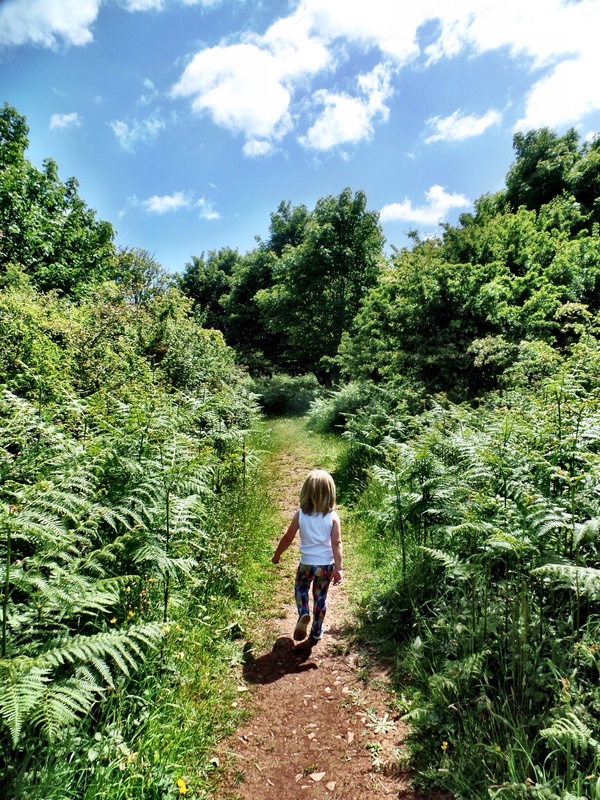 We’re so lucky to have Berry Head on our doorstep: as well as the spectacular views from the top it offers a winding woodland on the way. 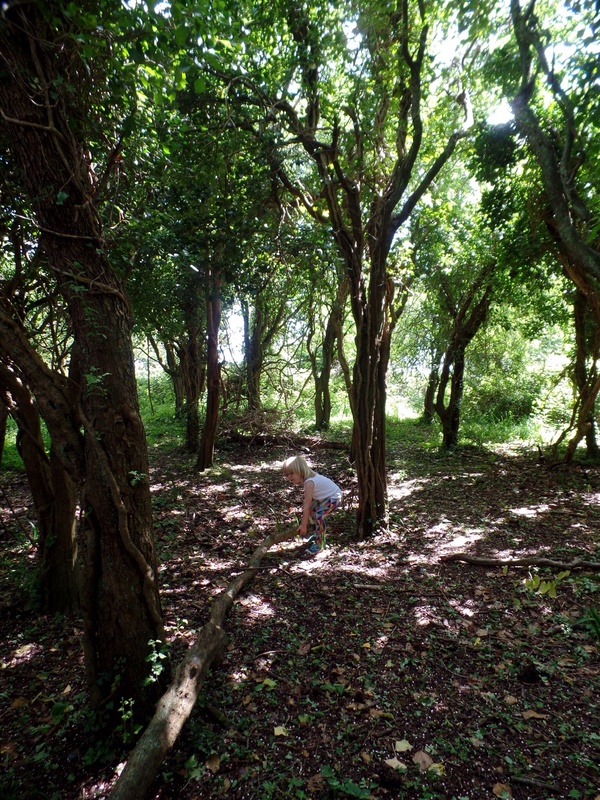 I had thought, once we’d wandered through our usual patch of green, that we might make our way to the cafe on the headland. As he is increasingly wont to do, though, Arthur had other ideas. 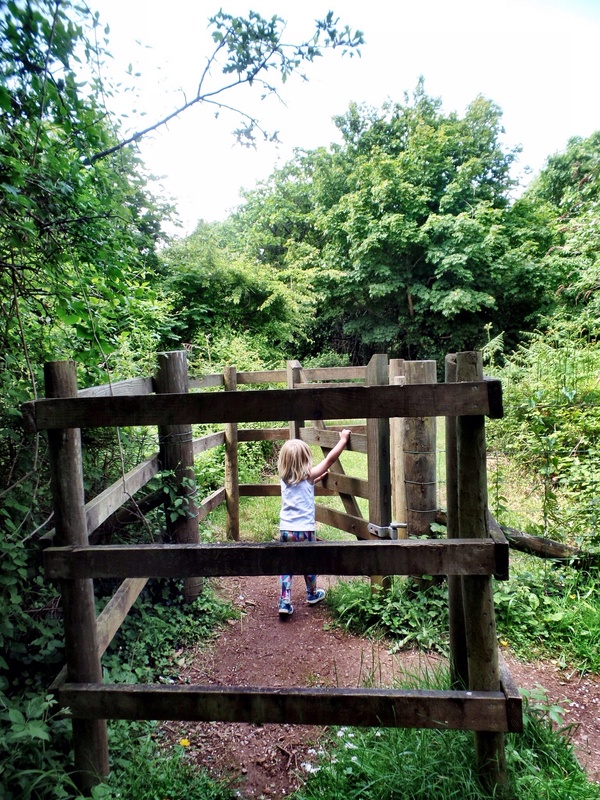 There is a gate just off the main path which I’ve noticed several times before, but which we’ve never actually been through. Not for any particular reason – it’s just not the way we go. This time though Arthur was intent on seeing what was on the other side. He actually managed, as I hung back dreaming of a latte, to get the gate open himself. And once he had? Well, it would have been churlish not to follow. 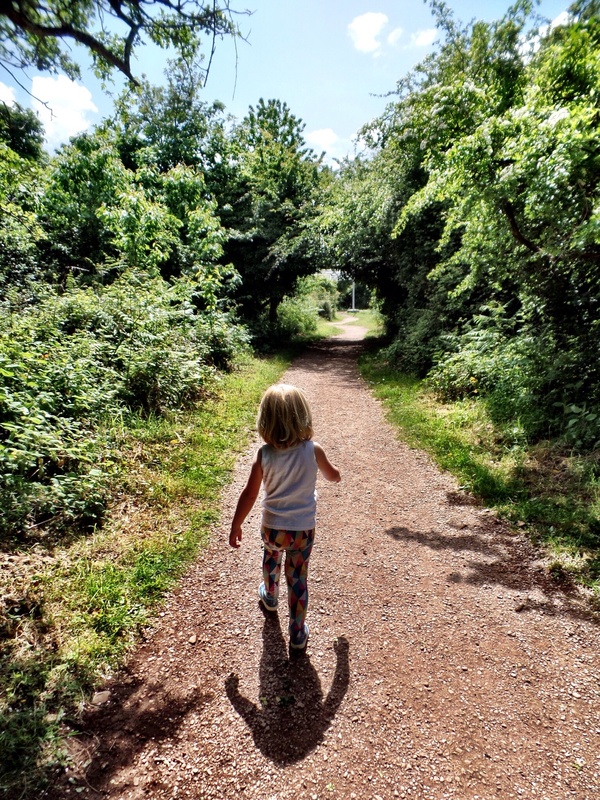 I let him lead the way from that point, and I think the images capture the adventure that followed better than I can in words. He was so fascinated by everything he discovered – things to look at and smell and touch and hear. Occasionally he threw a glance in my direction to check I wasn’t too far away, but essentially he was lost in his own little world. 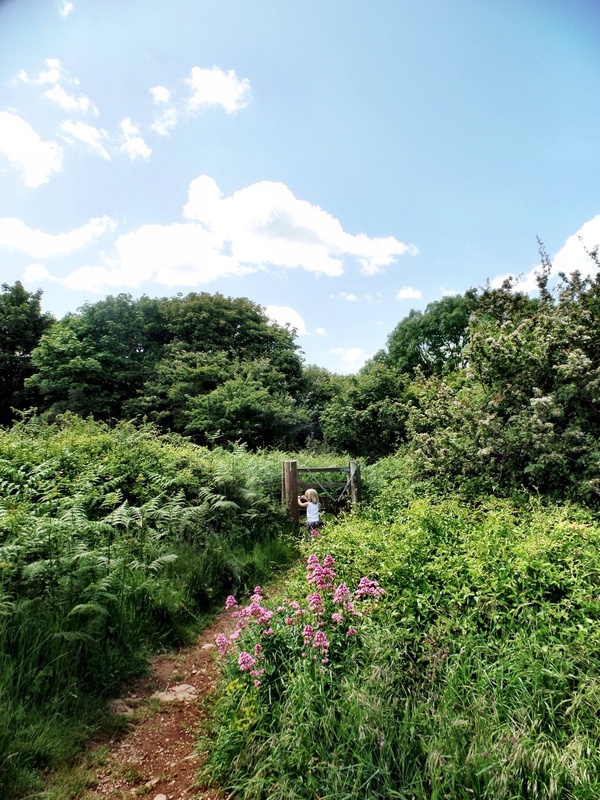 The finale to Arthur’s explorations was suitably spectacular: at the end of this little avenue he discovered what he could only imagine was a spaceship. 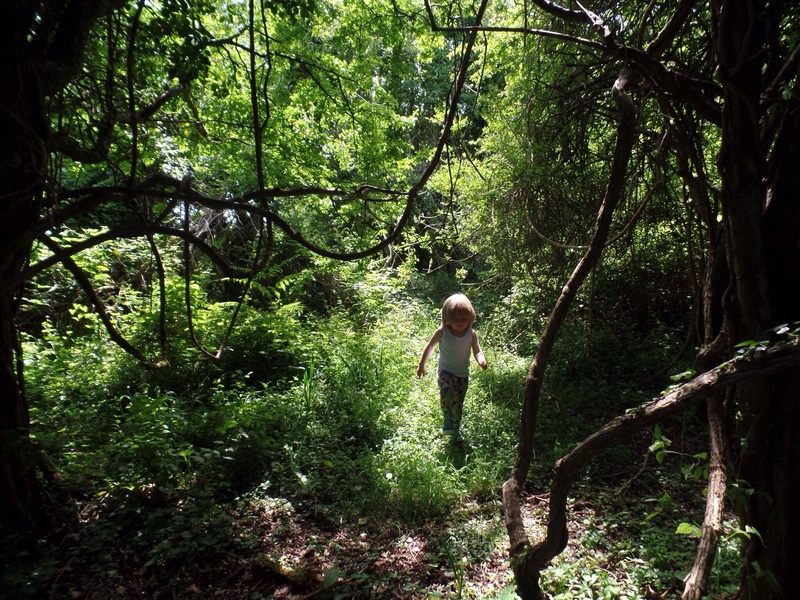 Not long after this last pic he made a dash for my shoulders – there had been plenty of exploring for one day. This particular adventure clearly left quite an impression on him. 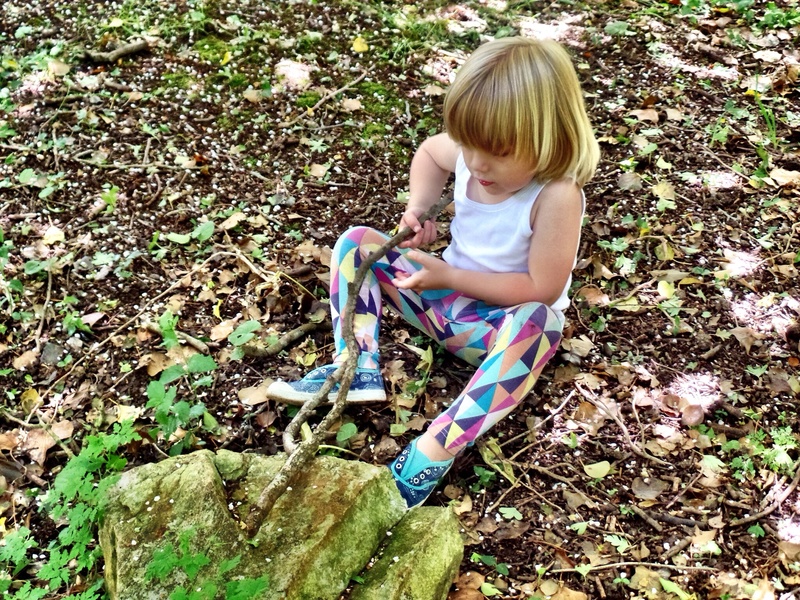 He has talked about the ‘big and strong’ spaceship in the woods as he’s drifted off to sleep the last couple of nights. I can only imagine the wonders he has been seeing in his dreams. 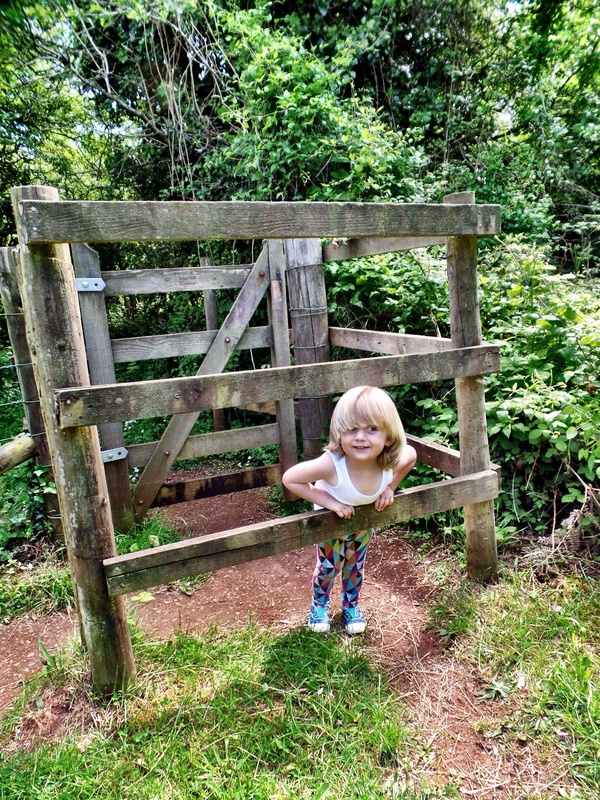 This entry was posted in Sophie is parenting, Sophie loves Brixham, Uncategorized and tagged adventures, Berry Head, brixham, exploring, toddler on June 8, 2015 by sophieblovett. I’ve decided I’m calling it. Admittedly it’s early days: as I’ve been writing this post the tapping of my fingers on the keyboard has been accompanied by the rain spattering the window panes. White horses skitter across the bay, and the leaves in the trees are being buffeted by a wind too strong to be called a breeze. But that’s just part and parcel of the season here in Devon. And looking at the week in balance there is no doubt in my mind that we have crossed the boundary into summer. It’s half term of course, so the streets of Brixham are filled with holidaymakers. Dangling lines over the harbour wall to tempt crabs into their buckets, clutching ice creams which drip deliciously over little fingers. On Breakwater beach paddlers are venturing deeper and deeper into the sea, delightedly splashing in the icy water and sometimes taking the plunge and diving in for a swim. It’s that for me that marks the transition into summer most clearly. I am still a fair-weather swimmer. I aspire to being one of the hardy souls who takes to the sea all year round, but I’m not there yet. This week, though, I made it in. 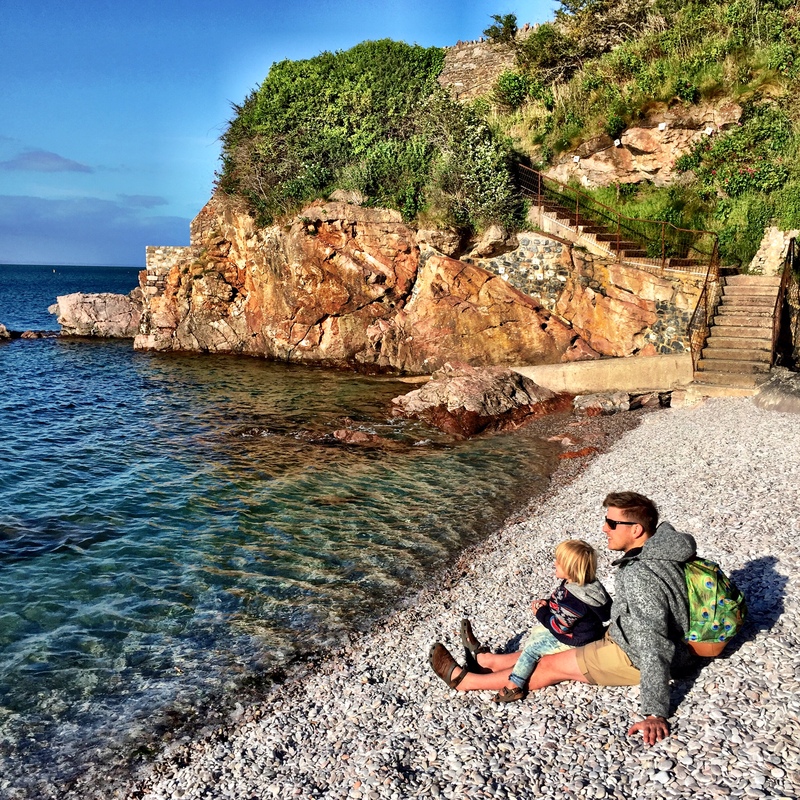 We’d managed to tire the toddlers out with stone-throwing, and leaving them dozing under the watchful eye of friends we headed for the water. Pretty feckin’ freezing, obviously. 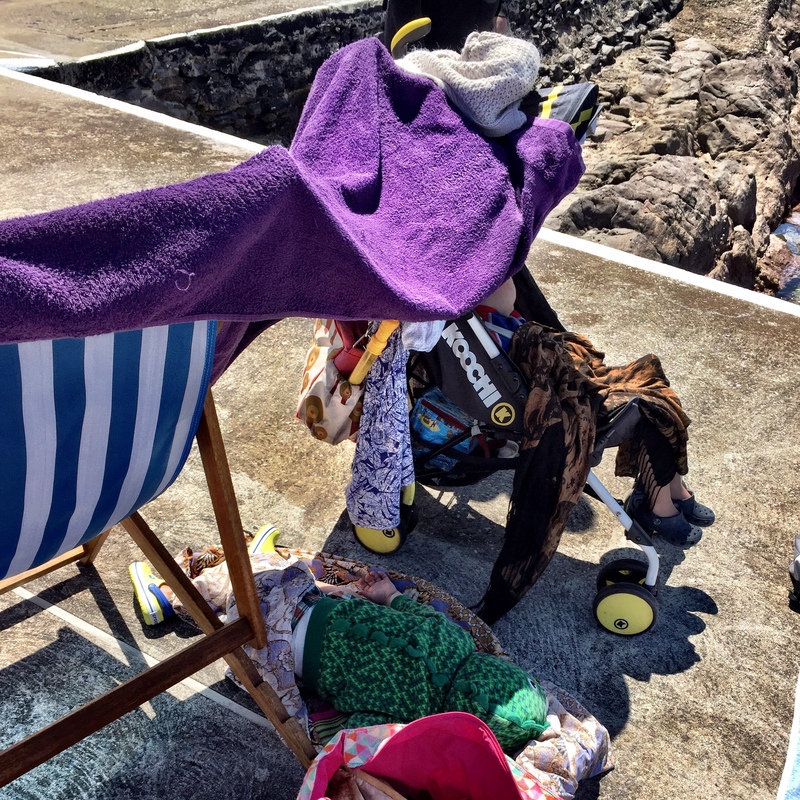 We’d hoped to have a dip in Shoalstone pool, which whilst it wouldn’t have been warmer would have at least given the option of jumping or diving in. But pump problems combined with excessively low tides put paid to that, so we scrambled over the rocks instead. Feeling my way through the shallows I almost gave up, but my stubbornness took over and saw me through till that all-important moment when numbness takes away the worst of the cold and you can just concentrate on how wonderful it is, floating in the salty sea looking back at the shore, cobwebs of all varieties well and truly blown away. We’d hoped to have another dip yesterday, but the sun wasn’t shining quite so brightly. It didn’t deter Arthur from paddling up to his waist – I think swimming kit is going to be an essential part of the arsenal when we head to the beach from here on in! The clouds cleared as the afternoon went on, and the beach was still busy when I walked back from my council meeting at 9 o’clock last night. So yes, I’m calling it: summer is here. Stay tuned for more watery adventures over the weeks and months to come! My word of the week is summer. 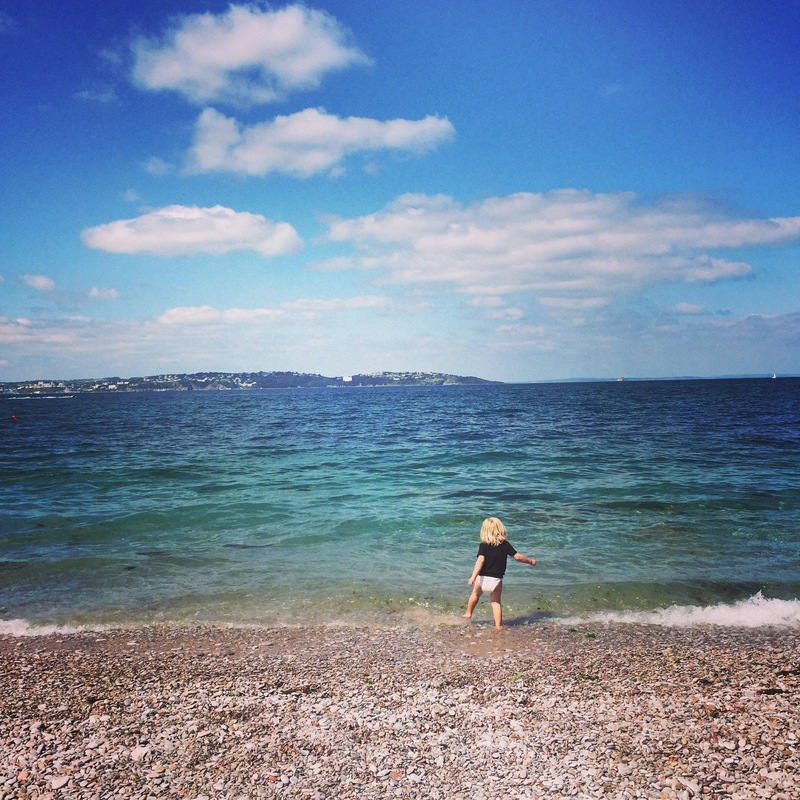 This entry was posted in Sophie loves Brixham and tagged Breakwater beach, brixham, Devon, sea, summer, swimming on May 29, 2015 by sophieblovett. Is it just me, or do the evenings all of a sudden seem to have got lighter? 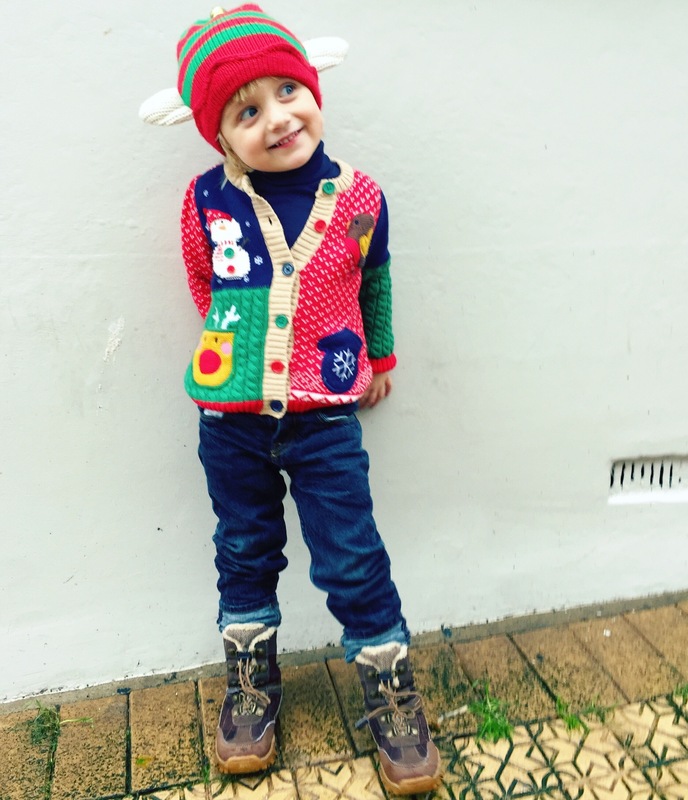 Toddler sleep habits aside, it is pretty wonderful. There is nothing that screams to me that summer is finally coming more loudly than when the days begin to stretch out beyond the afternoon. 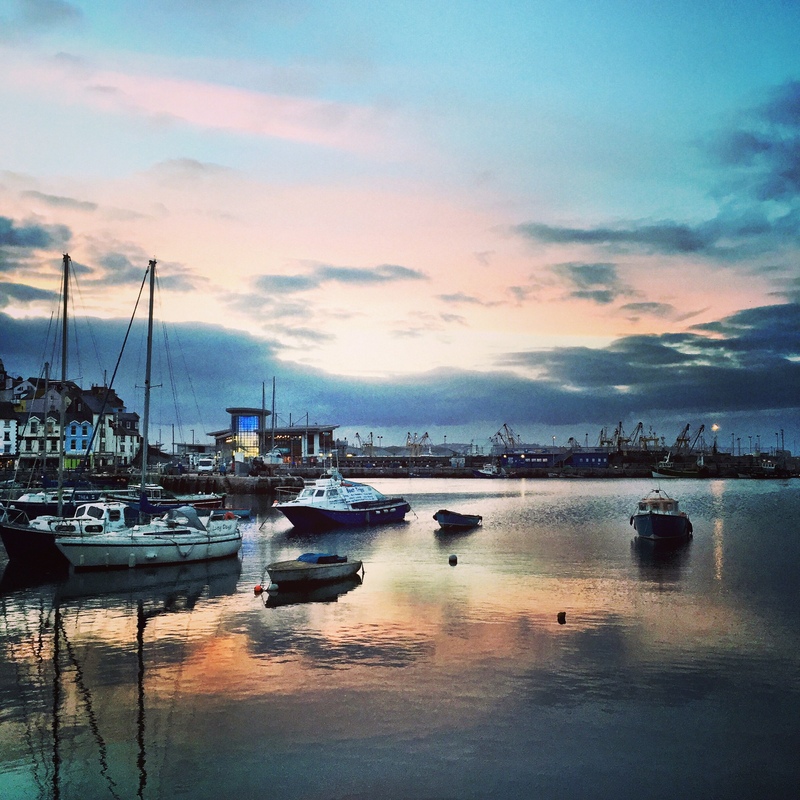 And it is when living here, in our beautiful little seaside town, really comes into its own. 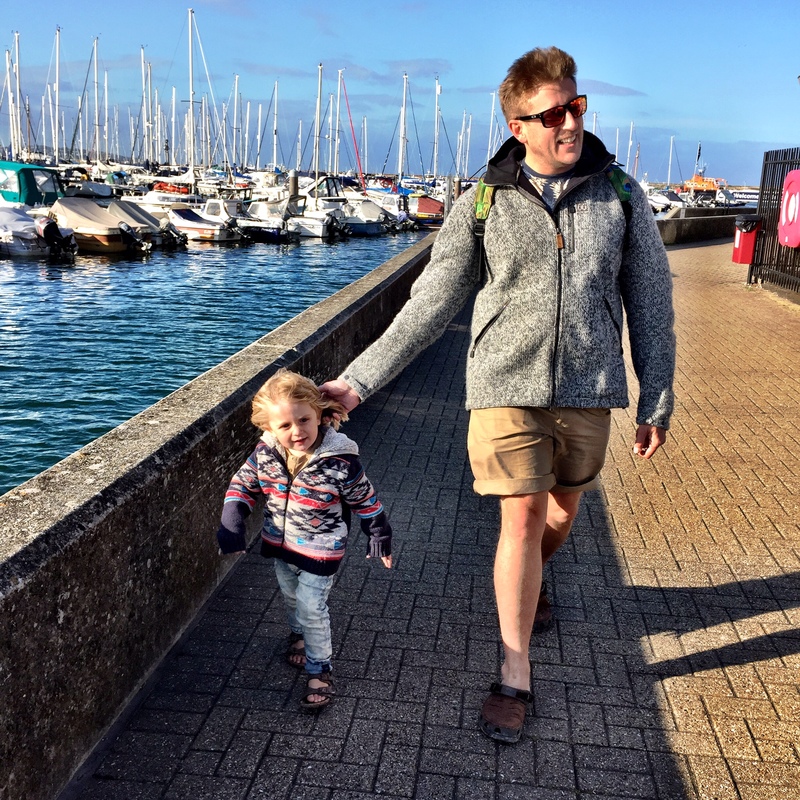 What with all the hectic we’ve been juggling recently we’ve really appreciated being able to go out as a family in the evenings more easily, wandering into town and soaking up the views. There is a sense of excitement and anticipation that all three of us share as we venture out just at that point when normally things would be winding down. Arthur has taken the evening strolls in his stride, enjoying another burst of energy and of course the obligatory beach time. 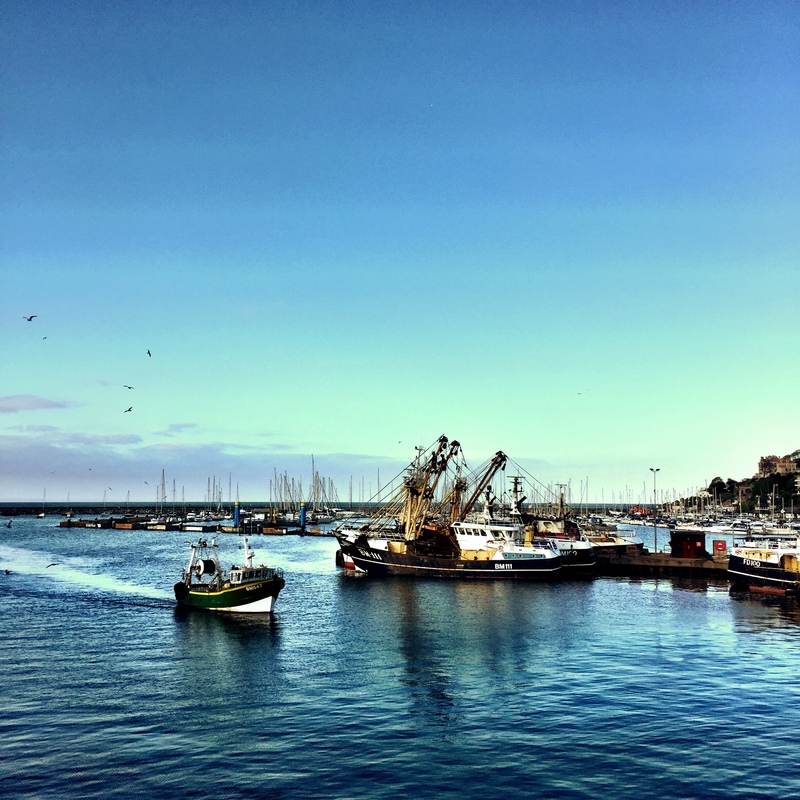 We even got to sit outside at Rockfish for a bit the other night, gazing out to sea as the fishing boats trundled through the twilight with their catch. 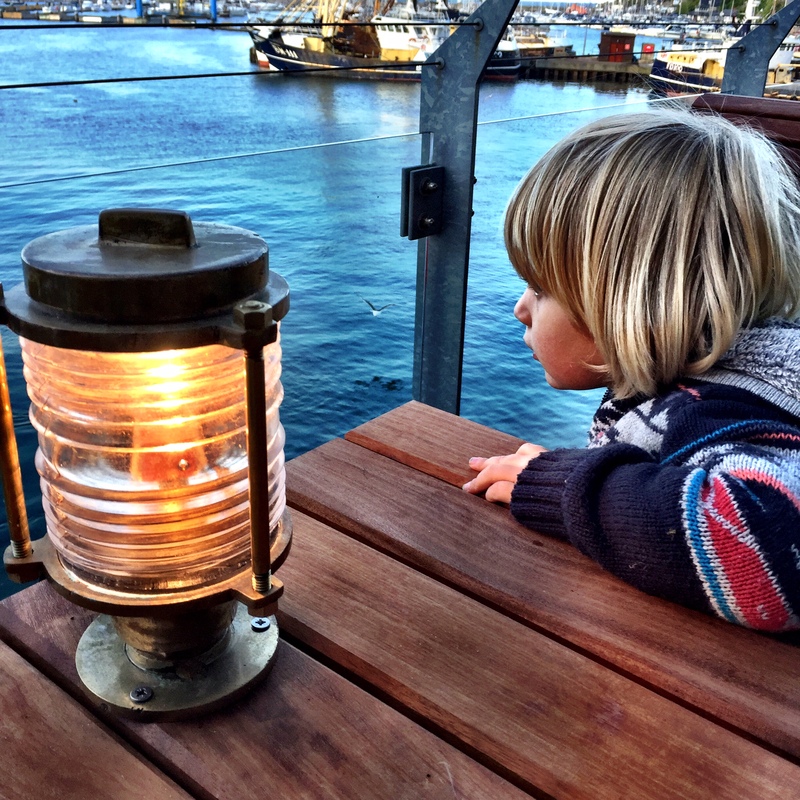 Arthur was absolutely transfixed as he watched the fish being docked – he hasn’t stopped talking about it since. There is certainly something incredibly liberating about the extra hours of daylight this time of year brings, and it’s making me ever-more excited for the summer. 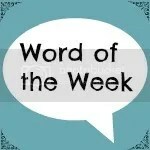 My word of the week this week is anticipation. 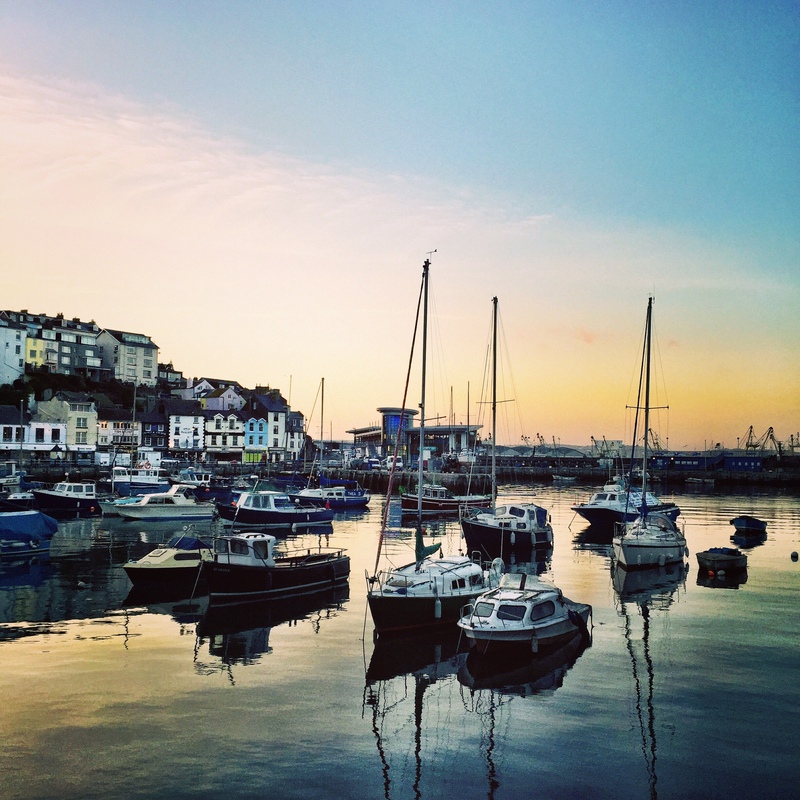 This entry was posted in Sophie is parenting, Sophie loves Brixham and tagged brixham, evening light, evening stroll, family, summer on May 22, 2015 by sophieblovett.